In the days before refrigeration, breakfast typically centred on consuming the last of the food from the night before. So in Asian cultures rice features heavily in breakfast fare. 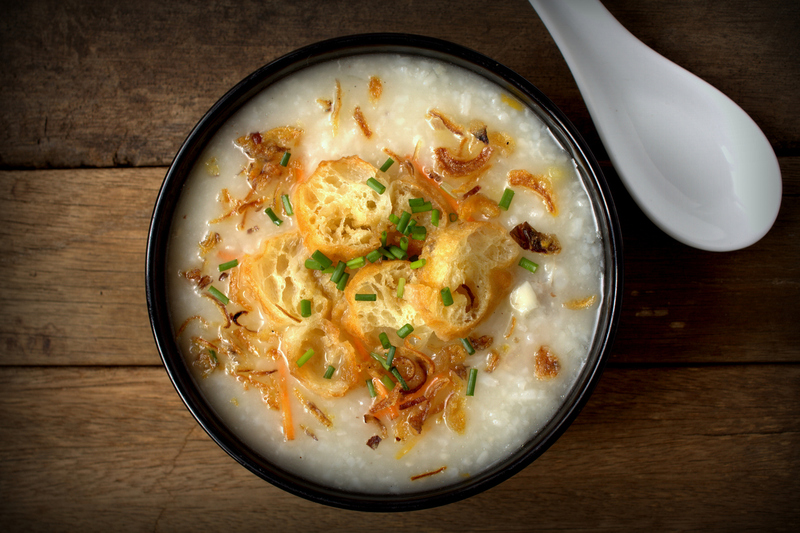 And congee is surely queen of the rice breakfasts. A savoury porridge made with either freshly-cooked rice or leftover, this gloopy delight is China’s answer to chicken noodle soup – the comfort eating equivalent of a lovely hug from Mamma. Recipes vary from region to region and family to family; but essentially rice is boiled up with huge quantities of liquid (water, chicken stock and outside China even coconut milk) until it breaks down and becomes quaggy. And now you get to add any flavour(s) you want. This is a hearty and warming dish and one which everyone should try, at least once. In India, particularly South India, dahi rice – leftover rice fried up with spices and yogurt – is a particular favourite. And the smell and sound of popping mustard seeds is redolent of many a breakfast in many an Indian household. And of course, who could forget the kedgeree – heralding from old colonial India, kedgeree became known as a true British classic dish, traditionally served at breakfast and consisting of rice, boiled eggs and smoked fish. Even the ubiquitous smoothie gets a look-in. What better way to bulk it up to make you feel full until lunchtime than adding some leftover rice to the blender and giving it a whoosh. Something you may never have thought of but which you’ll wonder how you ever lived without.